Jalal Sabur is on a mission. 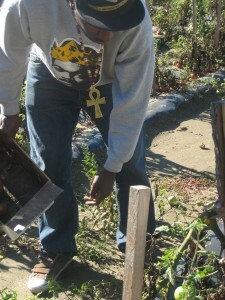 As a Community Organizer for the Westchester Political Action Coalition (a Westchester county environmental foundation) and a founding member of the Freedom Food Alliance (a project of the Malcolm X Grassroots Movement’s Food Justice Committee), Jalal is dedicated to bridging the gap between Black urban communities and Black rural farmers. With the goal of building a Black and Brown operated and supported food institution, this season the Food Justice committee began taking gleaning trips to harvest food that would ultimately be transported to the city and distributed to neighborhood residents and soup kitchens as well as organizations like Picture the Homeless. After our most recent trip to Vermont, I asked Jalal to discuss the importance of this work. Jalal picking the season's last tomatoes! MPL: What is the Freedom Food Alliance? JS: Currently, it’s an alliance between grassroots community organizations such as the Malcolm X Grassroots Movement (MXGM), Common Vision Council, WESPAC and Mothers on the Move (MOM); rural farmers from Vermont and upstate New York through the Food Security Roundtable and rural farmers from Vermont and western Massachusetts through Community Food Security; community gardeners in New York; and political prisoner Herman Bell. It seeks to give Black and Latino communities access to healthy food. It stems from work Herman Bell was doing in the late 1980s with Victory Gardens which was a project that connected farmers in Maine with community based organizations in the Bronx, Brooklyn, and parts of New Jersey to distribute food for free. The long term goal is to build a food institution, created, supported, run by and for Black and Brown communities. The short term goal is building relationships with farmers through gleaning trips. Gleaning is the process where farmers let people harvest the left over crops that they don’t sell. This practice started during slavery where slaves would take the left over crop from their master for their own need or to sell for a small profit. We are organizig gleaning trips not for profit, but because this is the quickest way to get people fresh, healthy food in the absence of our own farmland. MPL: In what ways will the Freedom Food alliance address food access in the city? JS: By building food institutions that will allow Black communities to be a part of the production and distribution of their own food, and educating other folks on how to be self sufficient. Other organizations that work on getting people acces to food are set up like charities or service providers. We are not trying to be a charity service, we want to help organize folks so we all know how to grow our own food and be self-sufficient. MPL: Why is it important to connect Black communities with Black farmers? 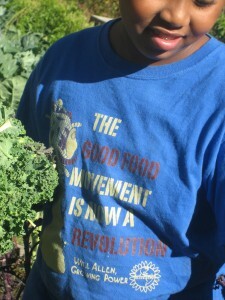 "The Good Food Movement is Now a Revolution"
JS: The industrial food system creates a consumer culture in Black communities and makes us reliant on corporations which don’t have our best interests in mind, and probably never will. It’s important for Black communities to have direct control over all of the systems that affect them, including food access. Connecting with farmers is the best way to ensure that you’ll have direct access to your food source. Having relationships with black farmers does that, but it also supports a dying breed. In the 1930s, Black farmers were 14% of the farming population, currently, they’re only 1%. The government hasn’t supported Black farmers the way they’ve supported other farmers. Therefore, Black farmers need the support of Black communities in urban areas and the communities need the farmers in order to get direct acces to healthy food. Lastly, having a relationship with Black farmers breaks down the stigma our community has towards farming. Myself and other Black food justice activists believe a connection has made made between farming and slavery and sharecropping. We’ve identified this aversion to farming as a symptom of post-tramatic slave syndrome. So connecting to Black farmers is important for the healing of our communities and for us to be self-determined. For more information on food and farming policies in the Black community, check out the First Annual “Black Farmers and Urban Gardeners Conference“, November 19-21st at Brooklyn College!